Creating a garden fish pond or just adding fish to your existing pond creates another way of expressing yourself in your garden. We don’t have room in our garden just now to have a pond with fish, but we have friends that do and we always look longingly at these fascinating garden features. The blending of plant and animal life in your garden just makes it seem complete, like you’ve built your own little ecosystem that you are lord and master over, albeit a generous and compassionate lord and master because you are responsible for all of the living beings in your domain. Koi are pretty easy to care for, but one thing that you'll need to guard against is the graceful Blue Heron, they love to eat them and many pond owners have come home to find their fish gone. Another way to add a water feature to your garden or patio is to with water container gardening. These miniature water features can be relatively easy to set up and maintain much like an aquarium. 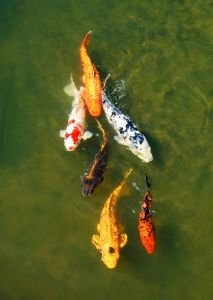 Adding some fish to an existing pond isn’t just a matter of going down to the pet store and choosing a couple of goldfish, bringing them home and tossing them into the pool and forgetting about them. It’s not all that complicated either, but the fish that you put into your pond do need some attention, particularly to their environment. A good book on the subject of fish and fish ponds is Koi Fish Ponds Made Easy. This book covers the various aspects of constructing ponds, choosing, and caring for your pond and its inhabitants.